pinballmars wrote: I would bet my favorite pair of socks that we'll never see Wally again. His transience is built into his character. He's not going to stay in one place. The road is his dharma! As for who his father is, I don't think the Wally scene drops ANY clue about that. The joke with Wally is that he has NO PERSONALITY. He's a guy who thinks he's Marlon Brando, though he bears no resemblance to him and can't even do a good impression. It's a joke about people, particularly young people, who don't have any character of their own yet, so they model themselves after an icon. Wally takes it to the comic extreme. It's brilliant for one scene, but could turn into a bad SATURDAY NIGHT LIVE character if they flog it anymore. So, I doubt that they will. Speaking of SATURDAY NIGHT LIVE, the Wally scene instantly reminded me of an old SNL sketch from the 80s in which Jon Lovitz is a big Woody Allen who also talks and acts exactly like Woody Allen. It's another joke about a man without a personality of his own. btw: since he says he is there to tell his parents that they can convert his bedroom into a study, doesn't this suggest that Andy is "dad?" Panapaok wrote: I really don't get why people hate that scene. For me the nature of the character is ridiculous. His look, how he talks, the stupid and empty-headed speech... All is insignificant and unbearable. Wally is just a silly, random tribute to Marlon Brando and nothing more. He would've fit right in with the original cast, in either season. I disagree. What bothers me most about the character (aside from just not being my style of humor -- give me Jacoby ranting about açai berries over this any day) is that it's more overtly parodic than anything else in the franchise to date. The original show spoofed genres and referenced Vertigo but never engaged in outright parody. Plus, Brando spoofs have been done to death. To me, it lacks the L/F originality. But I'm glad so many people enjoyed it! It's just a blip on the radar. I wish it didn't make me cringe so much when I watch it, but there's so much already in these five parts that I love, I really can't complain much about the comparatively few scenes that don't click for me. 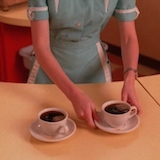 But it's better than Twin Peaks making fun of itself, isn't it? That's how I felt when Bobby instantly burst into tears upon seeing Laura's picture. It felt like Lynch and Frost were having a cynical laugh at the melodrama of the old Twin Peaks. 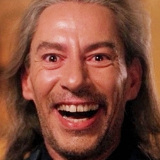 KillerBOB wrote: But it's better than Twin Peaks making fun of itself, isn't it? That's how I felt when Bobby instantly burst into tears upon seeing Laura's picture. It felt like Lynch and Frost were having a cynical laugh at the melodrama of the old Twin Peaks. Hmm, I didn't read that moment as self-parody at all. I know it didn't work for some people (for me it worked fine, walking the typical TP line of overstated emotion being simultaneously authentic and intentionally melodramatic, a la Sarah on the phone in the Pilot -- I imagine Bobby hasn't thought about Laura in many many years, and I accepted it as a believable reaction to suddenly seeing her visage in an unexpected place without any preparation). At the very least, even if you disliked that moment, I think it falls more into the category of "sincere misfire" than "sneering parody." DKL has always held Laura (and her theme) as maybe THE major axis of the world of TP. I don't think he'd make light of those elements intentionally. And besides, Bobby's line in that scene acts as the unofficial "title"/tagline for the episode. I don't think they were mocking Bobby either. I think it was just the same thing the show has always done - draw out a genuine moment and leave you unsure how to feel. It's been the same since the first pilot. N. Needleman wrote: I don't think they were mocking Bobby either. I think it was just the same thing the show has always done - draw out a genuine moment and leave you unsure how to feel. It's been the same since the first pilot. Maybe, but when Sarah Palmer bursts into tears someone is usually there to put an arm around her. But everyone just kind of looked weirded out by Bobby's reaction to the picture, even Hawk. I don't know, it just felt like the moment was being played for laughs, especially with the Laura Palmer theme instantly swelling up from out of nowhere. I always felt TP's melodrama (even the pilot) felt less forced than that. Last edited by KillerBOB on Tue Jun 06, 2017 12:21 am, edited 1 time in total. Bobby isn't Sarah. Andy and Lucy seemed affected; they held hands. I thought the reactions were not "WTF" but somber and respectful of his pain. I don't know what you expected people to do. i didn't take the scene with Bobby as anything other than an honest dramatic moment either. N. Needleman wrote: Bobby isn't Sarah. Andy and Lucy seemed affected; they held hands. I thought the reactions were not "WTF" but somber and respectful of his pain. I don't know what you expected people to do. I'm very likely overgeneralizing here, but many males (particularly a guy like Bobby that tries to maintain a tough guy facade in public) do not like to be seen showing raw emotion like that in groups and are even embarrassed by it (particularly in a setting like a police department). Other males often know that acknowledging such emotion will just make that embarrassment worse, so my guess is that they knew to just let him "cry it out" and not make a big deal of it. (I don't think its a good way to deal with emotions, but it's very much a reality in the world I've seen.) Anyway, I saw their responses as fairly natural in such a setting. Also, Bobby may have reformed (remains to be seen), but he was likely suspected by Harry and Hawk of some of the bad stuff he committed as a kid. Harry may have let it go (without Cooper around, he often took things at face value), but I'm presuming Hawk always knew what he was capable of and maintained a distance. Also, Frank clearly isn't one to comfort someone. BMS242 wrote: Also, Bobby may have reformed (remains to be seen), but he was likely suspected by Harry and Hawk of some of the bad stuff he committed as a kid. Harry may have let it go (without Cooper around, he often took things at face value), but I'm presuming Hawk always knew what he was capable of and maintained a distance. Also, Frank clearly isn't one to comfort someone. Yeah. You have to wonder whether Bobby is ever haunted by what he did. I thought I would turn detective and see what occurs during the 30th minute of episode 4 (430). Low and behold what have I deduced?????? Only that our dear friend The Giant is clearly a huge Wally supporter too. For at this precise moment in the episode is where Wally's 'Lewis and Clark' monologue begins. Mairzy wrote: I thought I would turn detective and see what occurs during the 30th minute of episode 4 (430). Low and behold what have I deduced?????? Only that our dear friend The Giant is clearly a huge Wally supporter too. It all revolves around Wally. Wally is the key to all of this. He’s the one who’s doing it. I can see him through the monitor. I can see his face. I hope that I never see that face, ever, outside a screen.